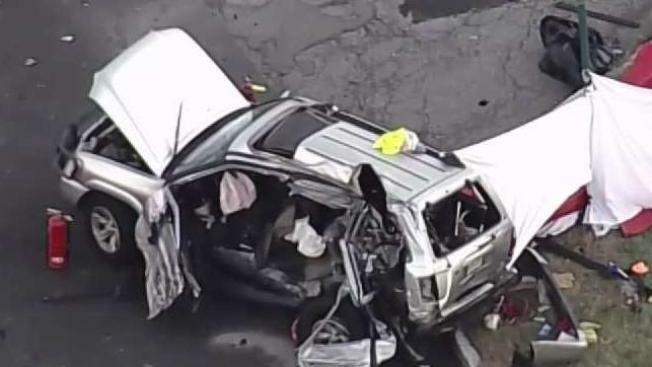 A woman and a child were killed when a tractor-trailer smashed into their SUV on a New Jersey roadway Thursday, police say. 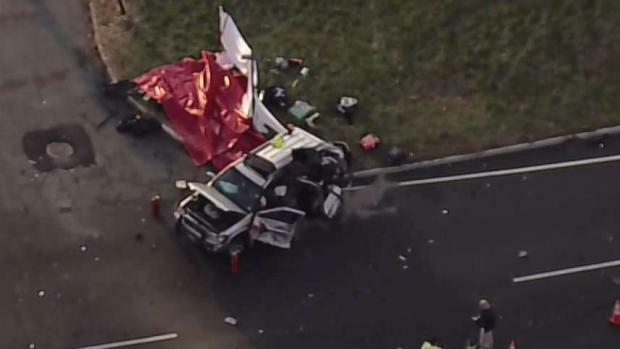 Chopper 4 over the scene at U.S. Highway 206 North and Furnace Road in Chester shows a devastating aftermath, with the SUV obliterated and the tractor-trailer having come to a rest in the backyard of a nearby house. Investigators believe the tractor trailer was going north on Route 206 and slammed into the SUV as the driver of the car was trying to turn left from Furnace Road onto Route 206 southbound, according to Police Chief Thomas Williver at the scene. The SUV was pushed onto the right shoulder, and the truck veered off the roadway, hitting a utility pole and careening into a nearby backyard, where it hit a car, a fence and a tree before finally coming to a rest. The man driving the SUV was taken to a local hospital. The driver of the tractor trailer was not physically hurt. Williver said police responded to a rollover accident with an entrapment at the same intersection recently. While quiet up until the recent pair of accidents, the intersection has been dangerous for drivers in the past, he said, adding there is no stoplight there. Neighbor Cindy Geborde said she's witnessed many accidents there. "This is dozens of times that his has happened since I've been here in three years," she said. "I think there should be a light, personally... people have to die before they make something make sense?" An accident investigation is underway at the scene.